My Domestic Monastery: Father Knows Best - Answer Me This! 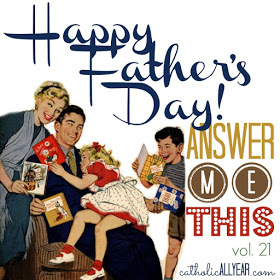 Father Knows Best - Answer Me This! Joining Kendra for all the fun! 1. What's the best thing about your dad? I have to give a shout out to my father-in-law, because I have a really good one! He is also really supportive of me, takes an interest in what I do, and has a great sense of humor (which he thankfully passed on to his son). But if I had to pin it down to specifics, I love how incredibly gentle he is with them, and how he takes time to teach them things (especially about nature, which is not my strength!). Ohhhh, and his patience. Andrew is SUCH a patient man! 3. What's the best advice your dad ever gave you? "Do what you love and the money will follow." My dad has always emphasized the importance of trusting God and discerning His will for you, and that's definitely influenced my marriage and family life. 4. What's something you have in common with your dad? We both love books with a fierce passion, and we both love connecting with people and getting them to open up. 5. What's the manliest thing you know how to do? Hmmm...woodworking? Mowing the lawn (such a satisfying task!)? Andrew's pretty darn manly, so he handles most of the manly things for me these days! 6. Who is your favorite fictional dad? Pa Ingalls. Surprise, surprise! He reminds me a lot of Andrew and of my Dad. Happy Father's Day to my three favorite guys- my Dad, my Dad-in-Law, and the Daddy of my babies. I love you three! Pa Ingalls was a good one. AH! How did I not think of Pa Ingalls?? My oldest is a mere week away from getting his driver's license (and my daughter will be getting her temps immediately after). One thing I keep stressing is to be ready for the crazy drivers. They are everywhere! Mowing is just so peaceful. And satisfying. I love looking out at our newly-mowed yard.